Type Variety of augite syenite or monzodiorite. Commons Larvikite is a variety of augite syenite or monzonite composed of ternary feldspars, ferroedenite, Ti-augite and lepidomelane. Nepheline, Fe-olivine and quartz occur less frequently. Name origin The rock is named after the type locality of Larvik, Norway. Mentioned for the first time by Brögger in 1890. Locality Stone quarry north of Stokke, 25 km NE from Larvik, Norway. Major minerals K-feldspar, plagioclase, clinopyroxene, pargasite, kaersutite, + hypersthene. Accessory minerals Apatite, Fe-Ti oxides (ilmenite, Ti-magnetite), zircon, titanite. Rarely also olivine or nepheline, very rarely quartz. 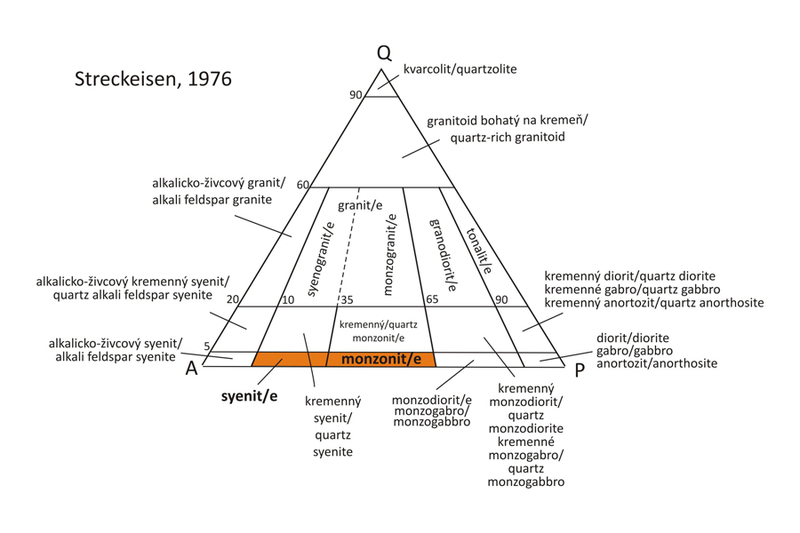 Classification The syenite field in the QAPF diagram for plutonic rocks (Streckeisen 1976) is defined by the modal content of quartz between 0 and 5 %, and the P/(P + A) ratio between 35 and 65. Colour Greyish-blue, changing to brown colours during weathering. Granularity Coarse-grained (3 mm – 1 cm) to very coarse-grained (> 1 cm) rock. Alterations The sample is sericitized and probably also kaolinized. The effect of adularescence is almost indiscernible on the unpolished and altered sample surface. Petrographic characteristics Coarse-grained monzonite or syenite with large pronounced phenocrysts of K-feldspars, up to several cm in size. The K-feldspar is ternary, containing all three endmember plagioclase-orthoclase components (albite, anorthite, orthoclase). The K-feldspar is typically microscopically inhomogeneous to form perthitic intergrowths of K-feldspar and acid plagioclase with a near-albite composition. The two alternating minerals give characteristic grey-blue lustre (adularescence or Schillerʼs effect) on polished surfaces, which originates below the surface of exsolved feldspars. Changing positions of sample or light source result in the apparent movement of the grey-blue lustre, giving impression of the moonlight floating on water surface. This optical effect typically occurs in adularia, after which it was named. Usage Larvikite is very popular in the World as facing stone in exterior and interior. It is used less traditionally as gemstone or decorative stone. It is cut to cabochons, pendants of various shapes, broaches, paperweights, door and chest fittings, decorative balls and eggs. It is also used as the material for tiny plastic art and larger sculptures and statues. Larvikite is extraordinary favourite decorative stone of Norway and it became a national Norwegian stone. „Blue granite“ is an informal name for larvikite. Dark-coloured varieties are designated as „Royal blue pearl granite“. Literature Neumann, E.-R., 1980: Petrogenesis of the Oslo Region Larvikites and Associated Rocks. Journal of Petrology, 21, 3, 499-531. Sørensen, H., 2003: Development of Nepheline Syenites in Rift Zones – information from three Ring Complexes. Geolines, 15, 140-146. Andersen, T., 1984: Hybridization between larvikite and nordmarkite in the Oslo region, S.E. Norway: A case study from the Sande Cauldron central pluton. Norsk Geologisk Tidskrift, 15, 3, 221-234. Neumann E.-R., 1980: Petrogenesis of the Oslo Region larvikites and associated rocks. Journal of Petrology, 21, 499-531. Jones, A.P. & Larsen, L.M., 1985: Geochemistry and REE minerals of nepheline syenites from Motzfeldt Centre, South Greenland. American Mineralogist, 70, 1087-1100. Subhedral crystals of K-feldspar (Kfs) and Ti-augite (Aug). Ti-rich magnetite (Mag) and other Fe-Ti oxides occur in intergranular spaces between K-feldspar and augite. Apatite (Ap) is ubiquitous accessory phase, showing typical hexahedral cross-sections perpendicular to the z-axis. This cross-section is in the extinct position in crossed polars, because apatite has hexagonal symmetry. It is also a single-axis mineral and its optical axis is thus identical with its z-axis. In contrast, cross-sections parallel with the z-axis have rectangular shapes and they exhibit a parallel extinction (upper right image). 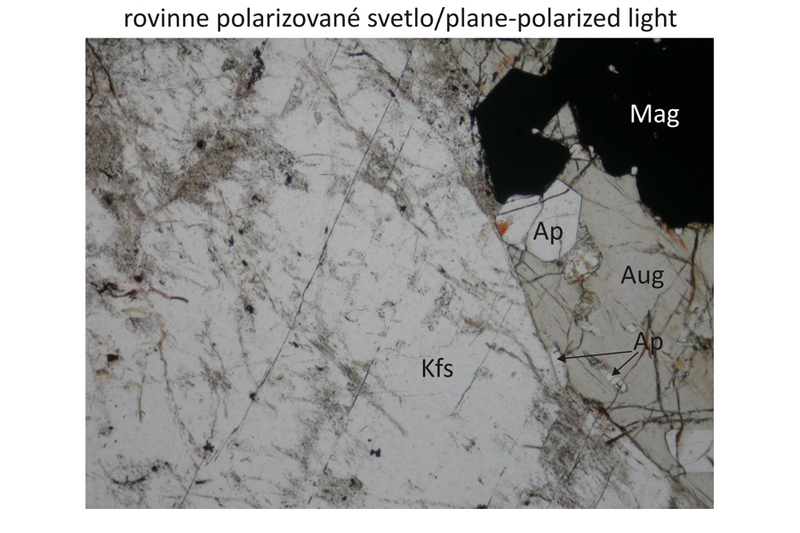 Ti-augite (Aug) has low interference colours in crossed polars. 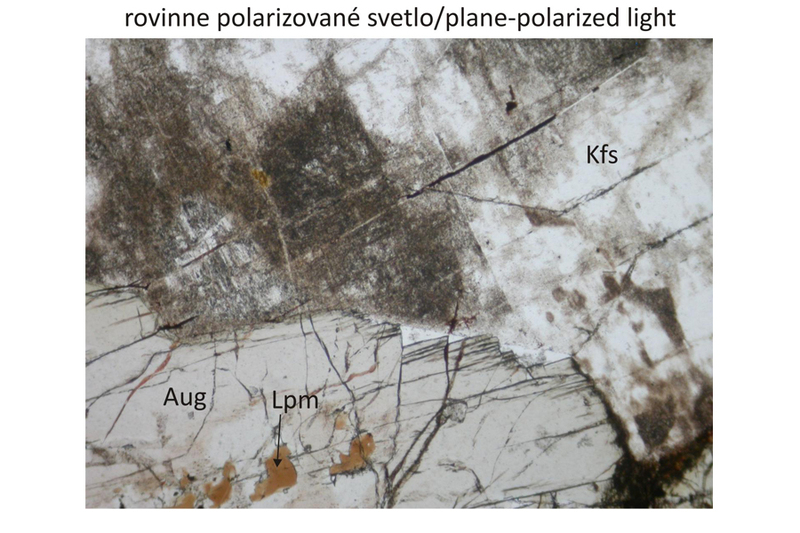 Brown lepidomelane (Lpm) – biotite enriched in Fe3+ – is rarely enclosed in the augite. Lepidomelane is microscopically indiscernible from ordinary biotite. Biotite is now a group name for phlogopite, siderophyllite and eastonite. 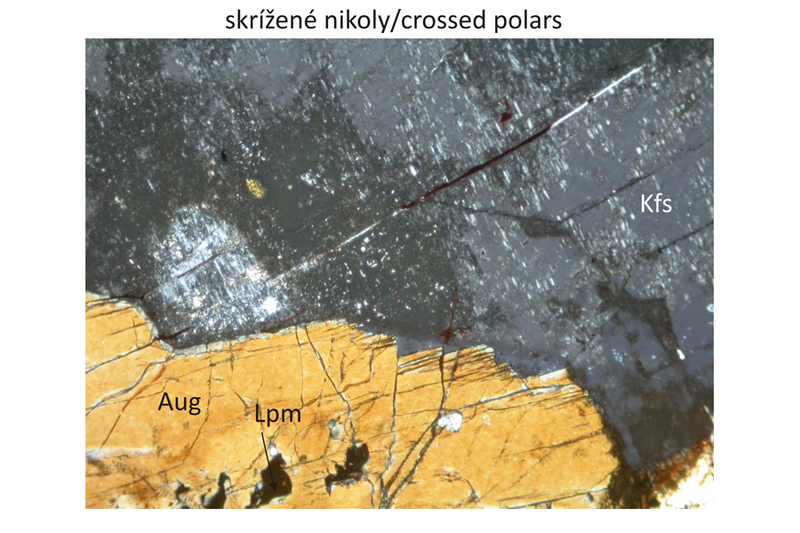 K-feldspar is microperthitic (lower right image) and contains exsolved acid plagioclase (bright bands in the K-feldspar seen in extinct position). 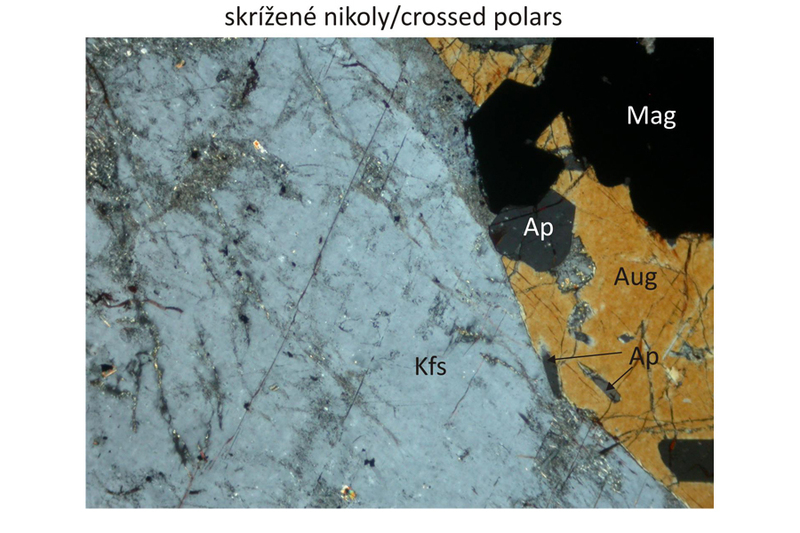 K-feldspar is mildly altered – probably sericitized and kaolinized (bright region alongside augite – Aug – in crossed polars in lower right image, or grey region in plane-polarized light in the lower right image). Larvikite is moderately Si-undersaturated, what is expressed by the presence of normative olivine – ol and sometimes also by a very small amount of the normative nepheline - ne. A high Al2O3 content results in the presence of normative corundum – c. The rock is also typical of increased contents of normative albite – ab and orthoclase – or. Comment All provisional hypersthene – hy´ – was exhausted for the creation of normative olivine – ol. A portion of provisional albite – ab´ – was used for the creation of normative nepheline – ne and true albite ab listed at the end of table. 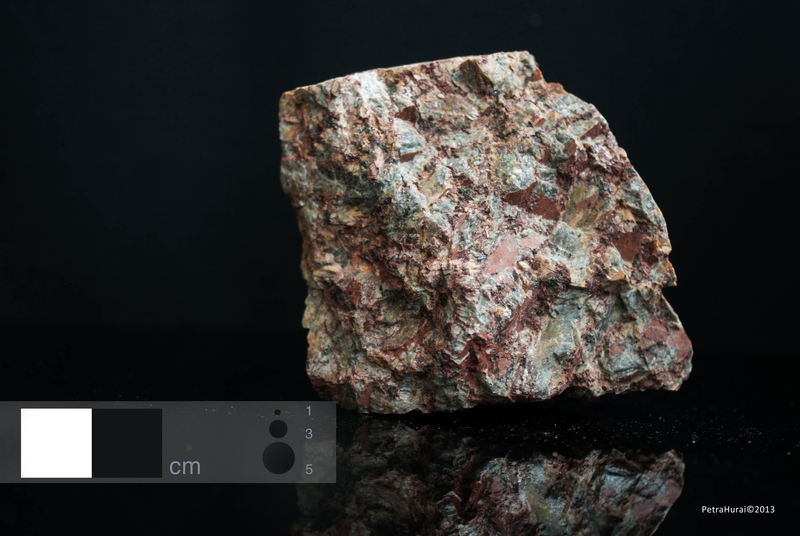 According to chemical and mineral composition, larvikite corresponds to augite syenite or monzonite with relatively high Al2O3, Na2O and K2O contents. It is similar to the augite syenite from the Gardar province, southern Greenland. Larvikite is a metaluminous (sometimes slightly peraluminous) rock with the A/CNK molar ratio (Al2O3/(CaO+Na2O+K2O) = 0.94 and the A/NK ratio (Al2O3/(Na2O+K2O) = 1.44 (see table with chemical analysis). Larvikite does not differ from a common syenite in terms of the composition of main oxides. Larvikite has increased contents of some trace elements, such as Ba (to 1390 ppm), Sr (up to 1230 ppm). It is also slightly enriched in La, Ce and Th.